For our second stop in Bulgaria this month, I chose a dish that is among the most loved in Bulgaria: palneni chushki or stuffed bell peppers. Stuffed peppers are one of those recipes that are popular across the world, in cuisines as diverse as Middle Eastern, Central European or even Scandinavian! 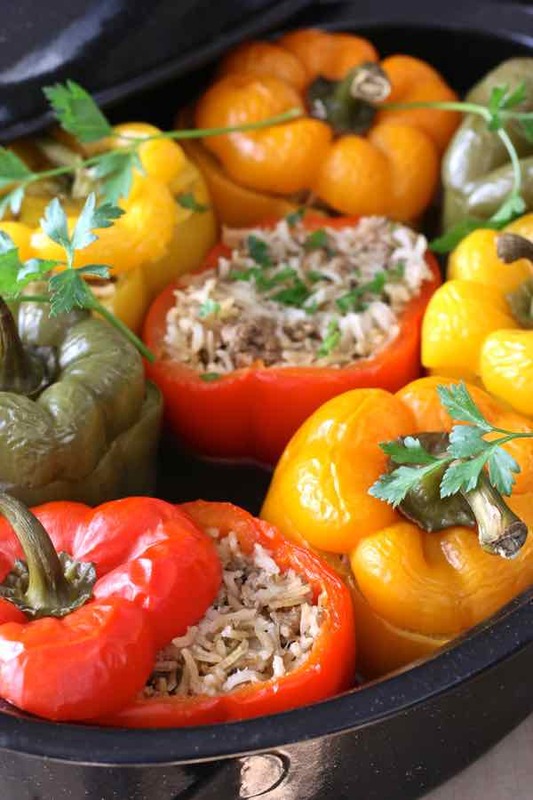 The Bulgarian version, palneni chuski, calls for fresh or dried bell peppers that are stuffed with meat, usually pork, beef or veal, as well as rice and spices including paprika and savory. 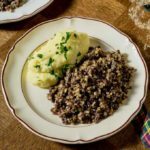 The vegetarian version is an important dish for the Christmas Eve meal, which is traditionally completely composed of vegetarian dishes as it is on the last day of the forty-day Advent fast that ends on Christmas day. 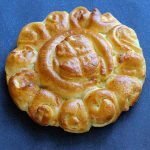 Another equally delicious and popular Bulgarian stuffed pepper recipe called chushki burek is prepared with cheese and tomatoes before being battered and fried. 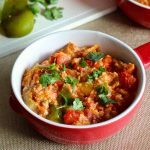 This version is definitely reminiscent of the Mexican chile relleno that is made with mild poblano chili pepper, which is often filled with cheese then covered with egg batter and deep-fried, although meat versions exist too. It is not easy to find the actual origin of stuffed peppers. Bell peppers as well as chili peppers have been cultivated for more than 9,000 years, with the earliest cultivation having taken place in South and Central America. The earliest fossil traces so far were found in southwestern Ecuador as well as Peru, where people grew their own peppers about 6,100 years ago. Columbus brought peppers to Europe in 1493, and they were quickly adopted and cultivated. It was the Europeans that gave peppers their name. The only pepper they knew at the time was the black and white spice. Indeed, the word pepper comes from the Greek word peperi (πέπερι) which means the “black spice”. When Columbus brought dried peppers back from the West Indies, Europeans said it was “hotter than the pepper of the Caucasus”, the popular spice. The name “pepper” stuck, and this is how those fruits have been called ever since. But do you know how bell peppers got their name? It is also Columbus who thought the milder peppers had the shape of a bell, gave them the name of bell peppers. So, despite sharing the same name, our table spice and the sweet and hot peppers that we grow are not related. The black and white pepper are the seeds of a plant called piper nigrum. Our garden peppers (bell peppers and hot peppers) belong to the genus called capsicum, and are members of the nightshade family (Solanaceae) , which also includes potatoes, tomatoes and eggplants. Where do pepper colors come from? The differences in bell pepper color mostly come from the time of harvest and the degree of ripening of the peppers. Indeed, green bell peppers are harvested before being allowed to fully ripen. Red, orange, and yellow bell peppers are always more ripe than green ones. They therefore require more time before being harvested. This is the main reason why they are typically more expensive. It is also interesting to note that in addition to their unique colors, each bell pepper has unique nutritional benefits. Green peppers feature an abundance of chlorophyll. Yellow peppers have more lutein and zeaxanthin carotenoids. Orange peppers have more alpha-, beta-, and gamma-carotene. Red peppers have more lycopene and astaxanthin, two other important carotenoids. All these compounds have various benefits including helping with cardiovascular, immune, inflammatory and neurodegenerative diseases. In terms of commercial production, China is by far the largest producer of bell peppers with more than 14 million metric tons produced each year. At about 2 million metric tons, Mexico is the second largest commercial producer, followed by Indonesia, Turkey, Spain and the United States at approximately 1 million metric tons. Bell peppers are very versatile and are used in various recipes using different techniques, including in dried form to make the paprika spice. The pickled version can often be found in jars. Fried peppers are a staple of Italian antipasti. 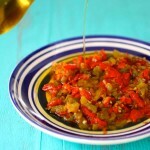 When those bell peppers are fried or roasted, then reduced, they can be used in dips or cooked salads like ajvar, muhamarra or hmiss (slata mechouia). If you feel like fresh raw bell peppers, why not go for Bulgarian shopska salata, Greek salad, Succotash or Nicoise salad? More in the mood for a soup? 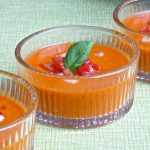 Then, traditional Spanish gazpacho is the summery chill soup for you! 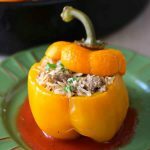 But out of all the recipes that call for bell peppers, the one that seems to be the most universal has to be stuffed peppers. 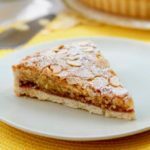 Indeed, the shape of this fruit seems to perfectly lend itself to stuffed recipes. 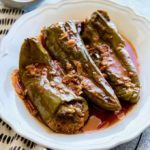 Actually, in the cuisine of the former Ottoman Empire, dolma describes a family of stuffed vegetable recipes that typically consists of stuffed pepper, grape leaves, tomato, onion, zucchini, eggplant or cabbage leaves (often called sarma). Those dolmas are characteristic of the cuisines of the Balkan and surrounding regions, including Middle Eastern countries like Iraq, Iran, Turkey, Azerbaijan, Armenia as well as Central Asia. In Greece, they are known as yemista or gemista. In Tunisia, Libya, Jordan and Syria, they are known as filfil mahshi, a recipe that my Tunisian mother used to make quite regularly, and which only differed by the spices that she used, including cumin and nutmeg, but could also include saffron and cardamom. In the Balkans, Central and Southern Europe, they are called punjena paprika in Croatia and Serbia, speca të mbushur in Albania, filovana paprika in Bosnia-Herzegovina, faszerowana papryka in Poland, polnjena paprika in Slovenia, polneti piperki in Macedonia, plněná paprika in the Czech Republic, plnená paprika in Slovakia, töltött paprika in Hungary, ardei umpluţi in Romania, yemista in Greece, peperoni imbottiti in Italy, pimientos rellenos in Spain, gefüllte paprika in Germany and of course palneni chushki in Bulgaria. In Scandinava, they are called fyldte peberfrugter in Denmark, täytetyt paprikat in Finland, fylltar paprikur in Iceland, fylt paprika in Norway and fyllda paprikor in Sweden. In the Baltic countries, they are called kimšti pipirai in Lithuania, pildīti pipari in Latvia and täidisega paprika in Estonia. But variants of them are also popular in Asia. In India, bharwan shimla mirch are bell peppers that are stuffed with spiced mashed potatoes, garam masala, cumin, coriander, and sometimes even include peanuts. In Korea, gochujeon is prepared with peppers stuffed with meat and tofu. 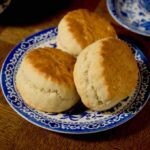 The recipe even made it to the United States and it has been a classic since the early 1900s. Actually, the first written record for the classic stuffed peppers recipe dates from 1896 in The Boston Cooking School Cookbook, which includes two versions of the dish, including one seasoned with onion juice. I personally prepared a simpler version of palneni chushki served with tomato sauce on the side. However, other versions call for tomato sauce, as well as carrots, in the stuffing itself. I will probably try this recipe next time. Also, Bulgarian stuffed peppers are often served with a yogurt-based sauce made with yogurt, flour and eggs. You will notice that I went crazy with the colors, as I was able to find beautiful green, yellow, orange and red bell peppers, although traditional recipes typically call for green or red. 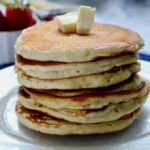 This recipe is one that I will make for my upcoming cooking class in Los Angeles on Sunday, September 18th. Come join us if you can! 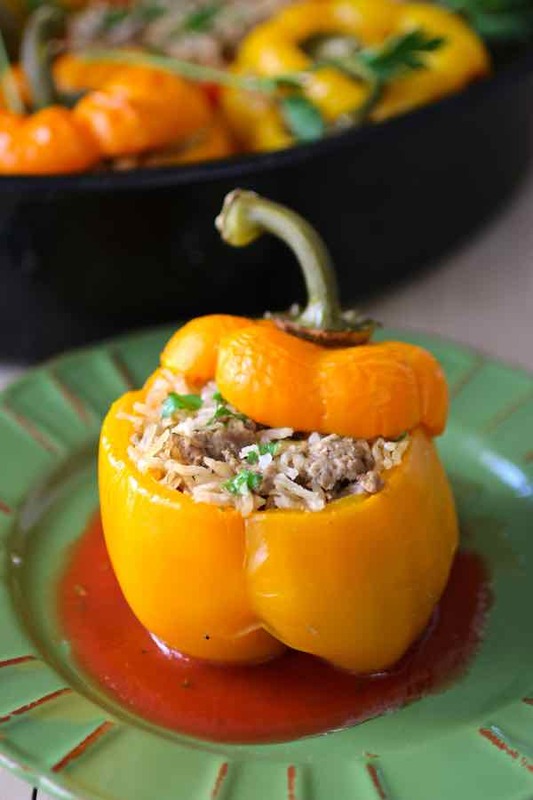 Palneni chushki is the Bulgarian version of the stuffed bell pepper recipe, a dish that is popular throughout Europe and other countries over the world. Heat the oil in a pan and sauté the onions for 2 to 3 minutes. Add the ground meat and cook for about 5 minutes. Add the rice and season with salt, pepper, savory and paprika. Add 1/2 cup of hot water and cook for another 5 minutes, or until the water is absorbed. Take off the heat. Stuff each bell pepper with the mixture using a spoon. 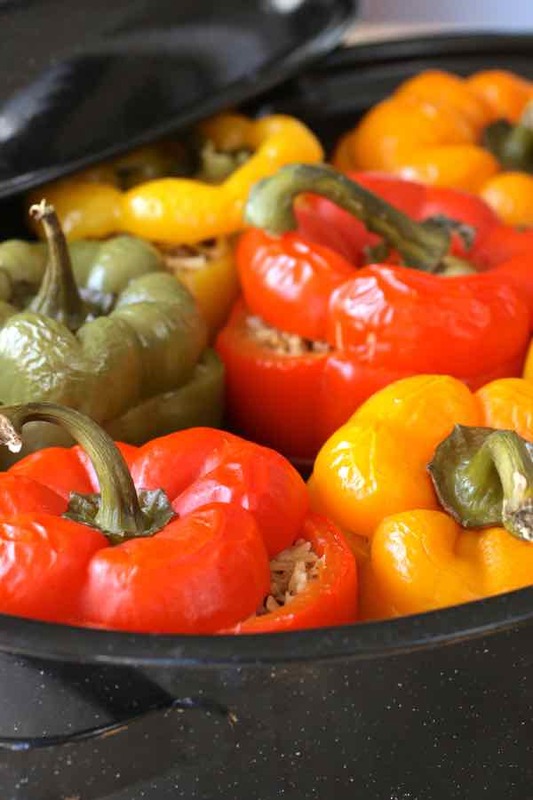 Place the peppers in a deep ovenproof baking dish, and top up with hot water to fill the dish at half level. Cover with foil or baking dish cover and cook for about 45 minutes in the oven. Uncover and cook for another 10 minutes until the peppers are cooked. Serve with tomato sauce or yogurt sauce (yogurt, flour, egg mixture). Thank you for the article. I used to live in Hong Kong where there used to be White Russian restaurants which served stuffed green capsicum with jullienned carrots and other vegetables stuffed and dauteed with a sweet and sour tomato paste. 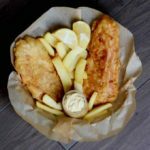 I never have been able to find the recipe or name of this delicious entree. 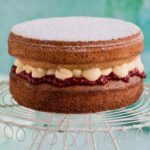 Do you know of such a recipe? Many thanks. Hey Asp, what you’re talking about is just the Russian version called фаршированные перцы in Russian. The Russian version typically includes carrots, but it’s essentially the same recipe. Enjoy! Is this cooked or uncooked rice? Are we filling up the peppers or baking dish? And “half level?” Like halfway up the peppers? So they’re just sitting in a pool of water? 1. The rice is uncooked. This step is to allow the rice to be semi-cooked before filling the peppers and cooking them in the oven. 2. Sorry if this was not clear. Yes, the water needs to cover about half of the peppers. There needs to be enough water for the peppers to bake. A variant of this is to add some tomato sauce to the water. 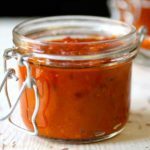 In that case, You would probably fill with the tomato sauce/water up to a quarter of the peppers, since this sauce will be used to top them and should not be too liquid.